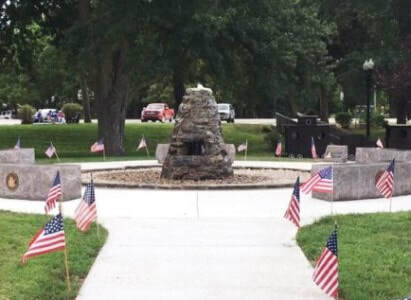 Five granite benches, each with bronze marker depicting the five branches of service, surround a center piece fountain. The fountain, which is being renovated, is an original Works Progress Administration (WPA) structure. One miles southeast of Glasco, Kansas, 301 South Cemetery Rd.